MEET EDDIE, MR BENN’S BEST FRIEND! Mr Benn has been on some incredible adventures over the years; joining a circus, playing hide-and-seek with cowboys and inspiring a pirate mutiny! These were enjoyable enough but now, when he steps inside the Emporium, he gets to share these experiences with his good mate Eddie. But who is Eddie? Find out more on this unconventional canine below! 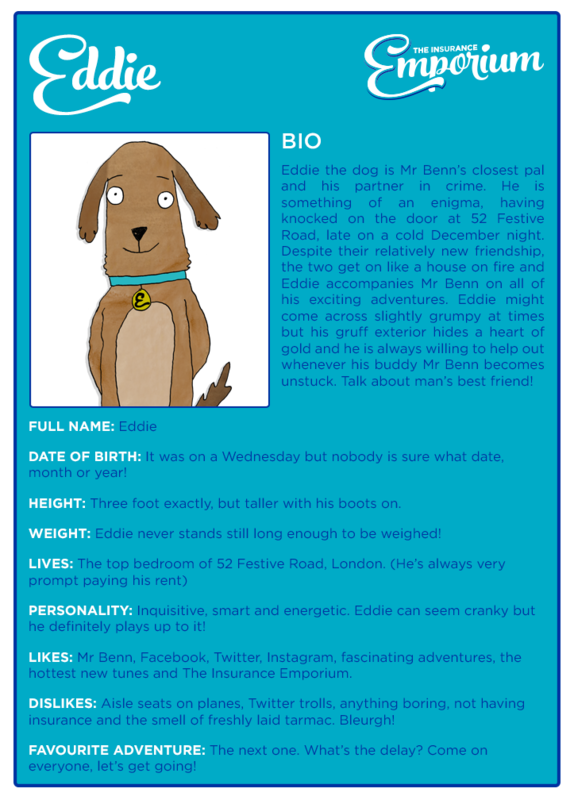 Bio: Eddie the dog is Mr Benn’s closest pal and his partner in crime. He is something of an enigma, having knocked on the door at 52 Festive Road, late on a cold December night. Despite their relatively new friendship, the two get on like a house on fire and Eddie accompanies Mr Benn on all of his exciting adventures, even if that means exploring the jungle or scaling a volcano! Eddie might come across slightly grumpy at times but his gruff exterior hides a heart of gold and he is always willing to help out whenever his buddy Mr Benn becomes unstuck. Talk about man’s best friend! Full Name: Eddie. People often assume his surname is ‘the dog’ but he only has one name; like Madonna or Adele! Date of Birth: It was on a Wednesday but nobody is sure what date, month or year – Eddie refuses to reveal his age! Height: Three foot exactly, but taller with his boots on. If only he knew where they were…?! Weight: Eddie never stands still long enough to be weighed, there’s always adventures to go on or his Instagram to update! Personality: Inquisitive, smart and energetic. He’s always up with the latest tech developments too. Eddie can seem cranky but he definitely plays up to it! Likes: Mr Benn, social media, fascinating adventures, the hottest new tunes and The Insurance Emporium. Dislikes: Getting the aisle seats on planes (he likes to look out of the window), Twitter trolls, anything boring, not having insurance and the smell of freshly laid tarmac. Bleurgh! Favourite Adventure: The next one. Where to now? What’s the delay? Come on everyone, let’s get going! All content provided on this blog is for informational purposes only. We make no representations as to the accuracy or completeness of any information on this site or found by following any link on this site. We will not be liable for any errors or omissions in this information nor for the availability of this information. We will not be liable for any loss, injury or damage arising from the display or use of this information. This policy is subject to change at any time.